Bases and outposts are one of the most important aspects of State of Decay 2. They provide you with shelter, storage, medical supplies, resources and a place for your comrades to stay. You’re going to start off with one, but you’ll soon start expanding into different locations, claiming as many of the game’s 20+ bases as you can. You’ll also want to upgrade them with new facilities, so they provide you with the best bonuses. 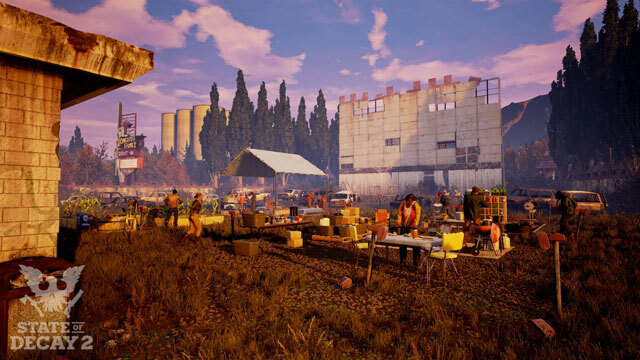 In this guide, we’re going to show you all State of Decay 2 home base locations. After the tutorial, you’ll get to claim your first base and start expanding it. Simply clear the area of zombies and go to the center of the location, looking for a flag that will let you claim it. This will ease you into what’s required to start building facilities, how they work and how to make the most of them. You’ll build facilities by going to empty lots, standing on them and pulling up the appropriate menu (Y). After you’ve upgraded your first base all the way, you’ll want to start claiming other places. Justineau House is where you’ll land if you choose this as your starting zone. You’ll find it in the southeastern corner of the area. It’s a decent place, but you’ll soon outgrow it and start dreaming of a bigger place. The Corner Office is a good choice. It’s in the middle of the map, so it’s equally distant from pretty much everywhere, and it starts off with the following: chic eatery kitchen, garden lvl 2, overlook, workshop lvl 2, sheltered beds and two parking spaces. It also has one large open slot, and two small outdoor slots, and it can be expanded with two outposts. It covers three floors of a building, and a small yard. It takes five survivors and 1000 Influence to claim this base. The Church on The Hill is equally central, and seems equally large, albeit with a much different layout. It consists of the following: a bell tower, four parking spaces, and two sets of pews, both of which are clearable. You also get one large open slot, one small indoor slot, and two small outdoor slots. Not a lot, considering it takes 1000 Influence and five survivors. Another interesting one is the Loch & Keogh Self Storage. You’ll find it in the northwestern corner of the map. It’s a storage facility with lots of open space and several small buildings. The facilities it has are: elaborate storage, two sets of sheltered beds, secret distillery, three parking spaces, watchtower, abandoned locker (clearable). You can connect it with two outposts, and expand it across one large slot, one small indoor slot and two small outdoor slots. You’re gonna need 1500 Influence and six survivors to claim it. One of the other bases that could prove interesting is Bridge Fort. It’s located in the south of the map, and slightly to the east, where the road going from west to east crosses the river. The facility houses one sheltered bed slot, one outer bed, three parking spaces, and two watchposts, one west, one east. It also has three open slots: one large, one small indoor, and one small outdoor. You need 500 Influence and four people to claim it. Container Fort is yet another potential home site for you, located in the far southwest corner of the map. This base doesn’t have much to offer when you get there, but it does allow for a lot of customization. As far as existing facilities go, it offers one firesafe storage 3, one workshop 3, and three parking places. In open slots, there’s two large slots and five small outdoor slots. It’s kinda expensive to claim, since it requires 3500 Influence and eight survivors. This is arguably the best base in Cascade Hills. Last, but far from least, there’s the base called Mohr & Mohr Distributing site. It’s a warehouse located in the northeast of the map, at the side of the larger road leading northeast. It takes 1500 Influence and six survivors to claim, and it’s well-worth the trouble. It offers one set of sheltered beds, one set of sheltered beds 2, a machine shop, four parking spaces, one huge fuel storage, and one backup generator; plus, you get two large slots, one small indoor slot, and two small outdoor slots. The starter home in Drucker County is called Vogel House, which is appropriately enough a large house surrounded by a walled-off estate. It’s location is in the north of the map. As far as facilities go, it offers one master bedroom, one chef’s kitchen, one double bunk room, one trash (clearable), and two parking spaces. There’s also two small outdoor slots open. It’s not much, but it’ll do as a start, since it requires zero influence and a single survivor to claim. When you get to Drucker County, you’ll probably want to claim the Barricaded Strip Mall. It’s in the middle of the northern part of the map. It starts off with an urgent care facility, three bedrooms, three parking spots and three large outdoor slots. You can also attach two outposts to it. Plus, there’s a Tae-Kwon-Do gym, a high-end kitchen, etc. All of this comes at a high price: 3500 Influence and eight survivors. Then there’s the Knight’s Family Drive-In, in the far east of the area. It has four parking spaces, an infirmary, an auto shop, a generator, a gate tower, and even a drive-in theater you can fix up and use to boost your community’s morale. It also has several small expansion slots – one indoor, three outdoor, as well as one large slot. You’ll need 1500 Influence and six survivors to claim it. Mike’s Concrete is another good one, and it’s in the city in the bay, right in the middle of the map. It has two sheltered bed facilities, a machine shop, four parking spaces, a huge fuel storage and a backup generator. It’s highly customizable, starting off with two large slots, two small outdoors slots and one small indoor slot. It might be the best base in Drucker County. Especially because it’s not horribly expensive; it requires 1500 Influence and six survivors. One more home base you might want to check out is Cabin Park Motel. You can find it in the south of the map, on the west bank of the large lake. You’ll need one thousand Influence and five survivors to claim it. It’s a fairly decent median in terms of what it has to offer. Existing facilities include one set of sheltered beds 2, one heavy trash (clearable), one country kitchen, one old well, two parking spaces, and one clearable seating area. Also, there’s two large open slots and one small indoor slot. Next up, we have Wally’s Bar & Grill. It’s in the center of the map, and a little to the east. The place is fairly cheap; you need 500 Influence and four survivors. However, it doesn’t really offer much in return. You’ll get one bar and grill, two parking spaces, and two seating areas (clearable). As for open slots, there’s one large slot and two small outdoor slots. The last stop you can find in Drucker County is the Wheelhouse Truck Stop, in the far west of the map. It’ll take 1000 Influence and five survivors. It has both upsides and downsides. It offers four parking spaces, a huge fuel storage, a restaurant kitchen, and an auto shop. On the downside, there’s only one large open slot, just one set of outdoor beds, and two clearable seating areas. One of the more interesting home bases that you can capture is called Whitney Field. It’s in the far south of the map, not far from the road that leads from east to west. The base offers three large slots and two small outdoor slots, as well as various different existing facilities. These include one set of sheltered beds 2, four parking spaces, fortified bleachers, two sets of outdoor beds, and more. It’s arguably the best base in Meagher Valley. Next up, we have Mazzara Farm. It costs 1000 Influence and five survivors, and it’s arguably the second-best in Meagher Valley. You can find it in the dead center of the map, on the east bank of the river. It will grant you one country kitchen, one well house, one crewhouse, one grain silo storage, and two parking spaces. It also offers two large slots, one small indoor slot, and two outdoor ones. The Rural Police Station is an interesting base. It’s in the northeast corner of the map. It has it’s fair share of open slots: two large, two small outdoor, and one small indoor. It also offers four parking spaces, a police armory, one set of doorless cells, one secure lockers, and one checkpoint. It’s a potentially interesting trade-off. To claim it, you’ll need 1000 Influence and five survivors. Another potentially interesting home base is the Squelones Brewing Company. 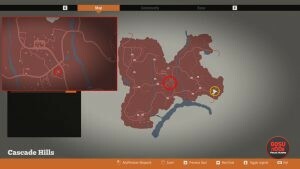 It’s in the center-east of the map, next to the large road leading south, and you can claim it for 1500 Influence and six survivors. The best stuff it offers are a water tank and several open slots: one large, three small indoor, and two small outdoor. It also includes a tasting room, three parking spaces, one primary still, one craft still, and one keg cooperage, which is clearable. Meagher Valley is also the home of Camp Kalenqua. It’s north of the large lake, and it takes 1000 Influence and five survivors to claim. It has quite a bit to offer, and is a pretty decent choice overall. It has two large open slots and two small indoor ones. Then, there’s the existing facilities: one heavy trash (clearable), one cafeteria kitchen, one old well, two parking spaces, one bunkhouse, and one clearable seating area. Lastly, there’s the Country Church. It’s in the west of the map. It’s on the side of the road leading from north to south, just north of the large S bend. It’s cheap; you only need four survivors and 500 Influence. Appropriately enough, it doesn’t offer much. You get one large open slot, and one small outdoor slot. There’s also three parking spaces, one set of rear pews and one set of front pews (both clearable), a community food bank, and a watchpost. We’re going to keep updating this guide with more base locations as we progress through the game. There’s more than this. There’s a massive shipping container base with multiple large and small slots in the south-east corner of the map just before the Leeds building and costs 3000 influence. Another is somewhere west I believe from memory, but this is a moderate size. This is the one I’m looking for! I got this base and i was wrong it was the container base it was in the bottom right of the small leg I was at not the whole map sorry about that, but this location is awesome it has built in barracks with 8 beds, 3 small slots 2 large ones and built in level 3 workshop and level 3 storage. And it’s next door to power and water plant which you can cap as outposts (2k ing for power, 1k inf for water), leaving you free to build what you want in those 2 big slots and 3 small ones. The church one posted here is incorrect. There is no infirmary, workshop, or kitchen there. I just claimed it. All it has is storage, watch tower, and sheltered beds…along with the 4 parking spaces. Is there a link to this? My mind is weird and needs to see a map. Knight’s Family Drive-In – “It also have two small expansion slots – one indoor, three outdoor” – does it have 2 or 4 small slots? Thanks for the correction, my bad. It’s four small slots. Some of the perks for each base are self explanatory (parking spaces, a well, the kitchen, etc). Some of the others may not be so easily identified with their function (examples, what does the checkpoint and doorless cells do at the police station, or what a keg cooperage does). Might i suggest that the perks (or at least the obscure ones) get a small description. Would help for better base selecting decisions. Great article though, love the list! I’ve finished the game (all legacies and all trophies on Xbox) so i’ll try EVERY settlement to see what those strange built-in facilities are. Thanks for the Info, it is good to see that each one of these places have some untold story as well. So I don’t know where you got the other four indoor slots and the other eight outdoor slots, because that information is incorrect. Thanks for the correction, we’ve fixed it now. What do you mean by connecting / expanding with two outpost? Do I get a larger home?